A pituitary tumor is basically an abnormal growth in the pituitary gland which is the part of brain that regulates the hormones in the body to maintain a balance. Most pituitary gland tumors are benign (non cancerous).Most pituitary tumor symptoms are not diagnosed during a person’s lifetime. 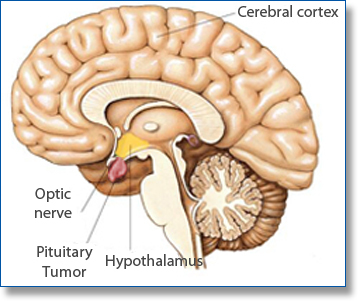 Ratio of occurrence of pituitary tumor is seen from the fact that up to 20% of the people have pituitary tumors. As pituitary tumor grows, hormone releasing cells of the pituitary can be damaged which can cause hypopituitarism.The cause of pituitary tumor is unknown. Pituitary carcinomas: These are malignant pituitary gland tumors and spread to other areas of central nervous system or outside the central nervous system but very few pituitary tumors are malignant. Invasive pituitary adenomas: Benign pituitary tumor that can spread to bones and skull or sinus cavity. Benign pituitary adenomas: These are not cancerous pituitary tumors. In this case, pituitary tumor, grows very slowly and simply do not spread from pituitary to the other parts of the body. Pituitary tumor can be functioning or non-functioning. Non-functioning pituitary gland tumor does not make hormones. Functioning pituitary tumor makes one or more hormones in more than normal amount. Most pituitary tumors are usually functioning tumors. The extra hormones made by pituitary tumor can cause signs and pituitary tumor symptoms.